Happy Thursday! I am excited that the weekend is almost here! I have the next week off work and I am excited to celebrate the 4th of July. My poor dogs are not as excited. I picked up this striped top a few weeks ago when I was in Chicago. 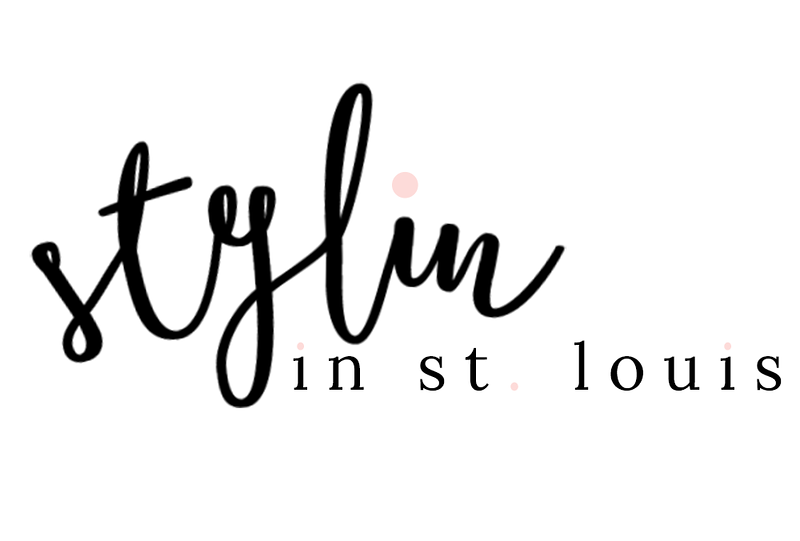 St. Louis does not have a Zara…so of course I had to go there! 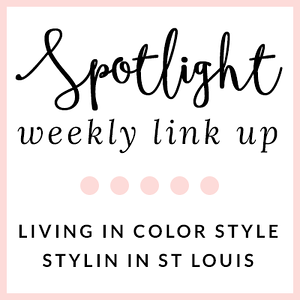 Spotlight: Our spotlight of the week is Audrey of Five Foot Nothing Shopping! 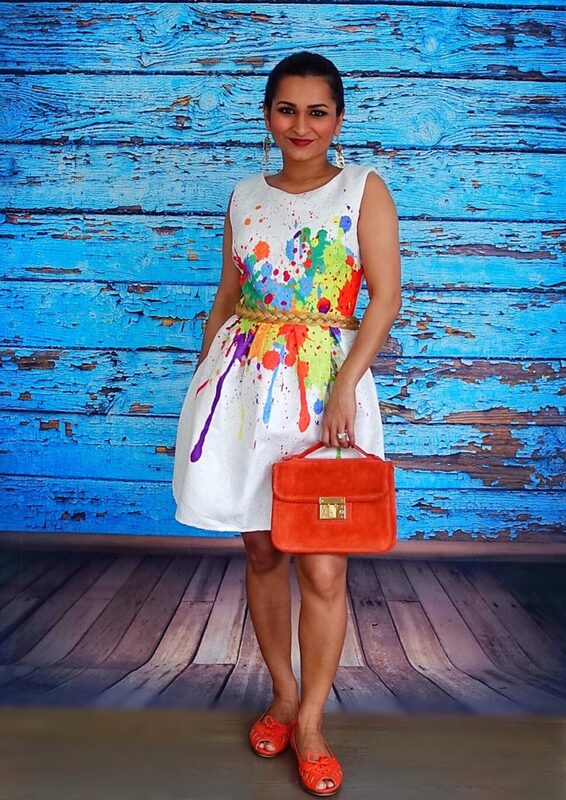 We love this color dress that Audrey is wearing! The colors are perfect for summer. Every detail is perfect! Be sure to check out her blog! Such a cute tee, I love Zara too. Love the bell sleeves on this striped top, Zara is one of my faves! You're ready for the 4th cutie pie! 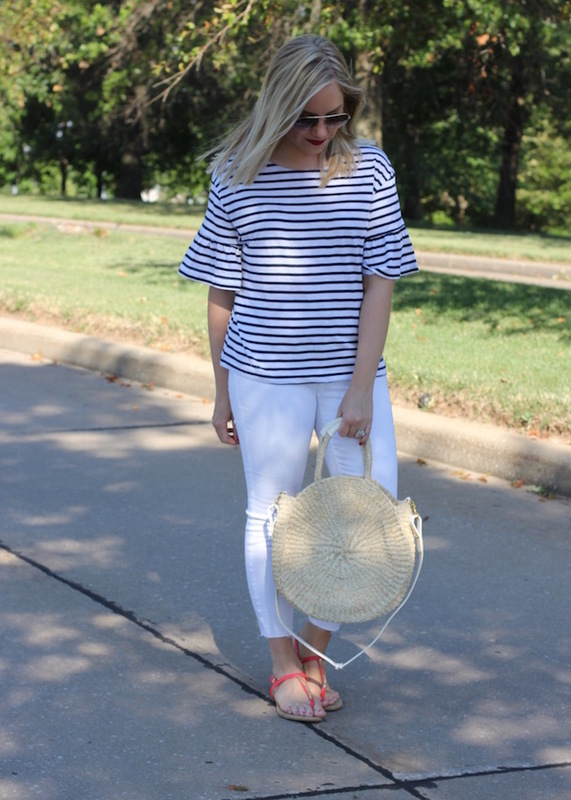 Such a sweet striped top! The cutest outfits! 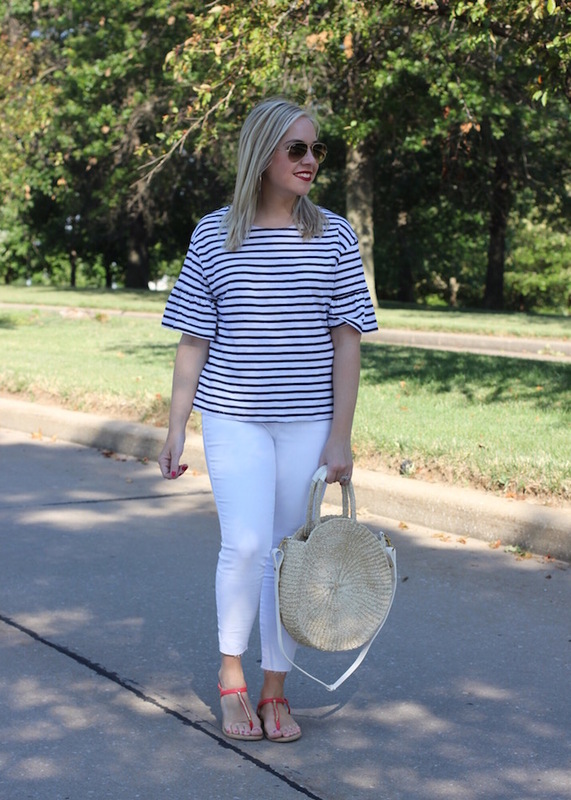 I love the stripes with your white jeans. The cutest outfit! 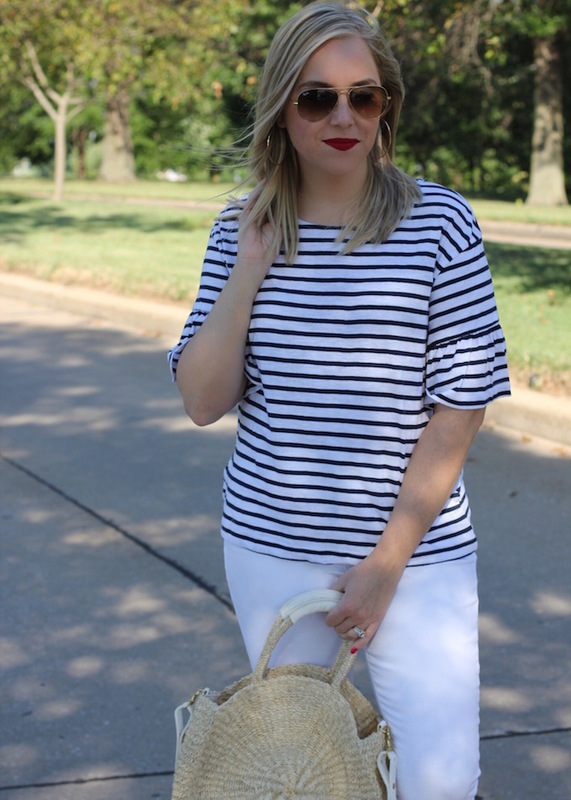 I love the stripes with your white jeans. This is such a cute outfit! I love your bag! Love this whole outfit!! Perfect for the 4th! Happy week off! 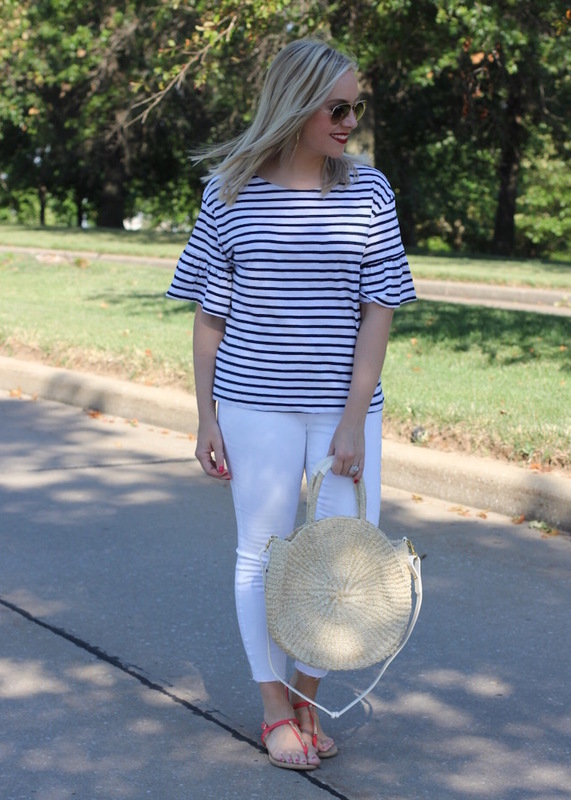 These stripes + bell sleeves are so good together! Great summer look, lady! This look is perfection! The striped top is so cute and I love that bag. This is exactly how I like dressing for the holiday, Jacqueline!! This top is SO cute! I actually just got a couple of tops with sleeves like this and I love them. Have a great 4th! Such a cute top!!! Perfect for the 4th!! I love the sleeves on your stripe top! 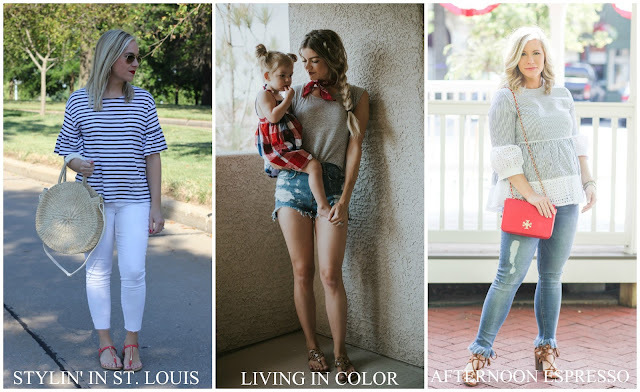 Such a cute 4th of July look! That round bag is adorable! Perfect for a 4th of July look! Love everything about this!! Your top is so pretty, love the round bag and you look amazing with red lipstick! Thank you so much for the feature! I am so excited! I also absolutely love your outfit, that bag especially is adorable! 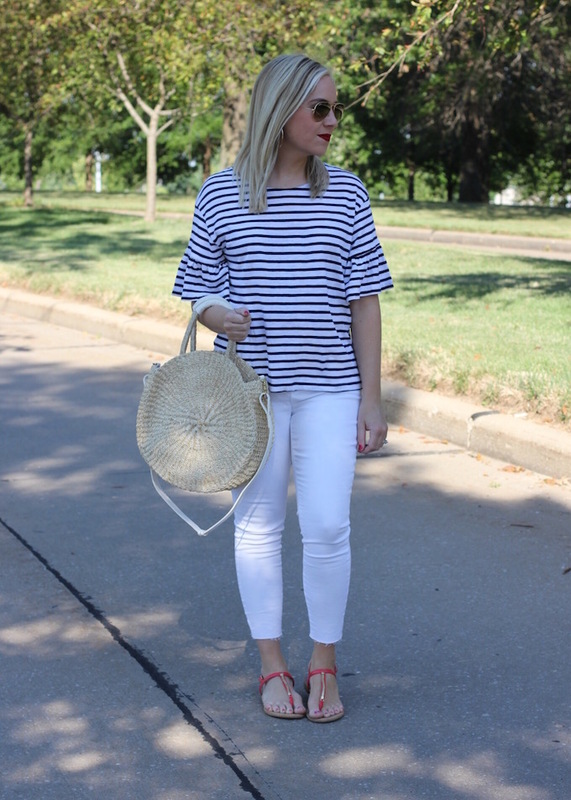 I love your cute sleeve detail on the top and the round straw bag is so summer and perfect! Love your navy style t-shirt. With white jeans is so perfect! Love everything about this look! 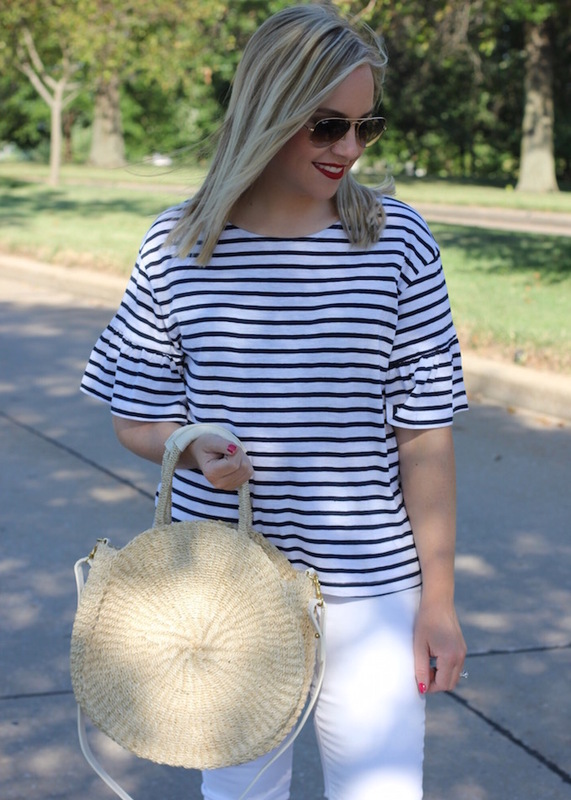 The striped t-shirt is super cute and that bag is perfect! Simply Beautiful! Love the combo! I am loving this super chic but simple outfit. That top is so adorable and the ruffled sleeves are a bonus!